All 50 states operate websites to make information on state expenditures accessible to the public, and in the past year these web portals continued to improve. 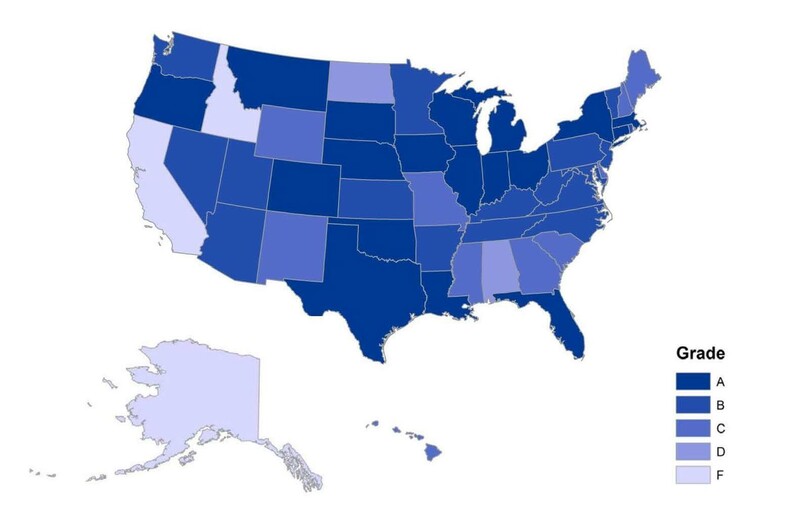 For instance, all but five states provide checkbook-level data for one or more economic development subsidy programs and more than half of states make that subsidy data available for researchers to download and analyze. Michigan streamlined its transparency data and added functionality to its transparency website, including allowing bulk download of all its data. West Virginia launched a new site with data on projected and actual public benefits of the state’s major subsidy programs. Utah and Arizona have joined several other states in adding data from localities, municipalities and school districts to their state transparency portals. This provides an inexpensive way to improve the transparency of the spending that often affects ordinary citizens most directly. Indiana, Minnesota, Nebraska, New Hampshire and Washington now prominently feature data on quasi-public entities with web pages dedicated solely to these agencies, boards, authorities and commissions. Leading States (“A” range): The number of Leading States has risen to 18, an all-time high. These states offer easy-to-use websites with data on an array of expenditures. Visitors can find information on specific vendor payments, and experts and watchdog groups can download and analyze the entire checkbook dataset. Advancing States (“B” range): Seventeen states are advancing in online spending transparency, with spending information that is easy to access but more limited than spending information provided by Leading States. Most Advancing States have checkbooks that are searchable by recipient, keyword and agency. Middling States (“C” range): Ten states are middling in online spending transparency, with comprehensive and easy-to-access checkbook-level spending information but limited information on subsidies or other “off-budget” expenditures. Lagging States (“D” range): The two Lagging States fail to provide tax expenditure reports and provide almost no checkbook-level detail on the recipients of economic development subsidies. Failing States (“F” range): Three states fail to meet several of the basic standards of online spending transparency. For example, two of the three (Alaska and California) do not host an online database for searching or viewing expenditure details, and only one makes tax expenditure reports available via a central transparency portal. None of the Failing States provide any information on economic development subsidies. Only 11 states provide checkbook-level information that includes the recipients of each of the state’s most important subsidy programs. While many other states provide checkbook-level information for some of their major subsidy programs, disclosure for all programs would provide greater transparency and accountability. The checkbooks in four states (Alaska, California, Idaho and Maryland) have limited online searchability. Six states (Alabama, California, Idaho, Missouri, North Dakota and Wyoming) do not provide tax expenditure reports that detail the impact on the state budget of targeted tax credits, exemptions or deductions. Even top-scoring states should continue to expand the universe of data accounted for by their transparency portals. Important advancements would include supporting municipal- and county-level transparency, public-private partnerships and special districts, and making those data available centrally. Most websites fail to match the user-friendliness and intuitiveness common to Americans’ everyday experience of the Internet, including, for example, the ability to easily compare data sets or graphs.